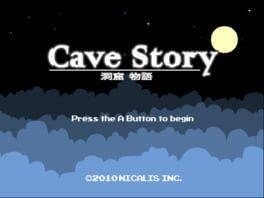 Cave story was created over five years by Japanese developer Daisuke "Pixel" Amaya, and released as freeware in 2004. Cave Story features a completely original storyline wrapped with personality, mystery and hours of fast-paced fun. Cave Story is an action-adventure game from the critically acclaimed independent designer, Daisuke Amaya--or Pixel to his fans. Overflowing with unmatched charm and character, Cave Story takes you into a rare world where a curious race of innocent rabbit-like creatures, called Mimigas, run free. You wake up in a dark cave with no memory of who you are, where you came from or why you're in such a place. Uncovering Mimiga Village you discover that the once-carefree Mimigas are in danger at the hands of a maniacal scientist. The Mimigas’ only hope rest squarely on the shoulders of a quiet, amnesiac boy who can't remember his own name. Run, jump, shoot, fly and explore your way through a massive action-adventure reminiscent of classic 8- and 16-bit games. Take control and learn the origins of this world’s power, stop the delusional villain and save the Mimiga! Cave Story is available from 14.99 to 14.99 from 1 shops.